Last week I had the privilege of meeting one of the founders of Fairytale Brownies, Eileen. She was excited to be in their 21st year of baking brownies for a living!!! Was this all she ever did? No, Eileen went to college, earned her degree, worked in corporate America before deciding to “jump ship” and sell brownies as gifts. These are the most moist delicious Belgian chocolate brownies I have ever tasted! They use only a perfect center cut. You might be wondering what they do with the edges: they tried selling them, it was a disaster, instead local ice cream parlors use them as toppings. The brownies are individually packaged in four sizes now: 3 x3 inch square brownies, smaller morsels and sprites are half the size of the brownies. The newest size is a Fairytale BAR size! The perfect size, in between the sprite and the brownies. I mostly love the story of how they named their product: Brownie in the dictionary definition can also be an elf. The fairytale is that they don’t have calories.. we KNOW they do- and what a treat! worth every single calorie. 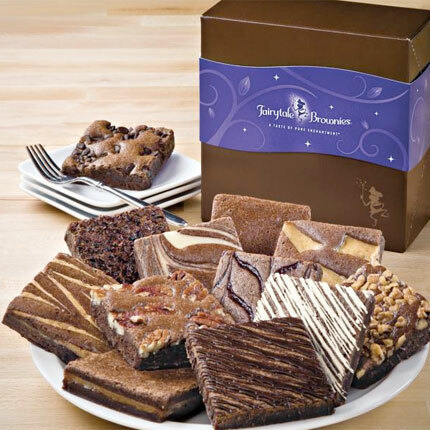 Eileen’s dream is that every person has had at least one fairytale brownie in the whole world. Quite a dream. You seriously NEED to try one of these. Grab a coffee or milk and enjoy. I love these so much!! !